The Global Volcanism Program has no activity reports for Jebel Marra. The Global Volcanism Program has no Weekly Reports available for Jebel Marra. The Global Volcanism Program has no Bulletin Reports available for Jebel Marra. The most prominent feature of the vast Jebel Marra volcanic field, located in the Darfur province of western Sudan, is the youthful Deriba caldera. The 5-km-wide, steep-walled caldera, located at the southern end of the field, was formed about 3500 years ago at the time of the eruption of voluminous airfall pumice and pyroclastic flows that traveled more than 30 km from the volcano. The Jebel Marra volcanic field covers a broad area of the Marra Mountains and contains early basaltic lava flows overlain by thick sequences of pyroclastic-flow deposits. The northern part of the field displays trachytic lava plugs and spines forming residual inselbergs and young basaltic scoria cones and lava flows. Ash eruptions at Deriba caldera may have continued into early historical time (Burton and Wickers, 1966), and fumarolic activity has been observed on the flanks of a small pyroclastic cone within the caldera. Burton A N, Wickens G E, 1966. Jebel Marra volcano, Sudan. Nature, 210: 1146-1147. Davidson J P, Wilson I R, 1989. Evolution of an alkali basalt-trachyte suite from Jebel Marra volcano, Sudan, through assimilation and fractional crystallization. Earth Planet Sci Lett, 95: 141-160. Francis P W, Thorpe R S, Ahmed F, 1973. Setting and significance of Tertiary-Recent volcanism in the Darfur Province of western Sudan. Nature, 243: 30-32. Vail J R, 1972. Jebel Marra, a dormant volcano in Darfur Province, western Sudan. Bull Volcanol, 36: 251-268. There is no Deformation History data available for Jebel Marra. There is no Emissions History data available for Jebel Marra. 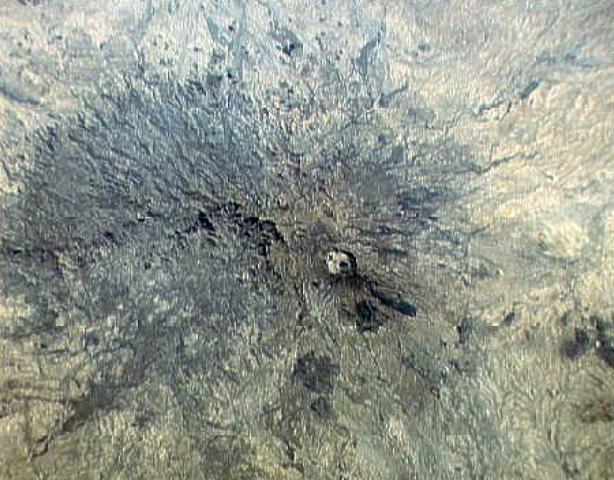 The small circular area just right of the center of this Space Shuttle image is Deriba caldera, the most prominent feature of the vast Jebel Marra volcanic field in western Sudan. The 5-km-wide, steep-walled caldera was formed about 3500 years ago at the time of the eruption of voluminous airfall pumice and pyroclastic flows that traveled more than 30 km from the volcano. Ash eruptions may have continued into early historical time, and fumarolic activity continues on the flanks of the caldera. NASA Space Shuttle image STS32-94-24, 1990 (http://eol.jsc.nasa.gov/). 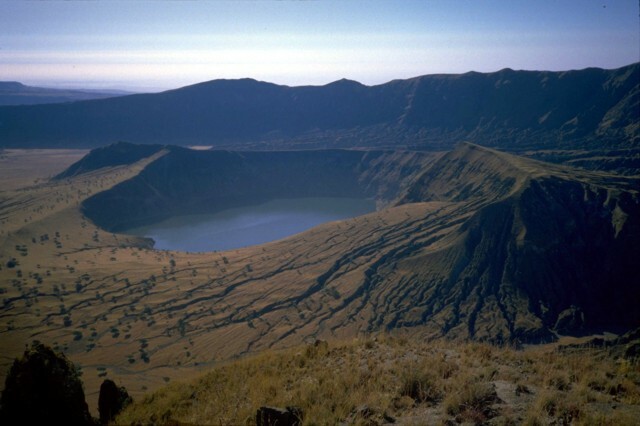 A lake partially fills a younger cone within the Deriba caldera of Jebel Marra volcano in this view from the north. The 5-km-wide, steep-walled Deriba caldera, whose wall appears in the background, was formed about 3500 years ago at the time of the eruption of voluminous airfall pumice and pyroclastic flows that traveled more than 30 km from the volcano. Post-caldera ash eruptions may have continued into historical time. Publisher: Direction des Mines et de la Geologie de l'A.E.F. There are no samples for Jebel Marra in the Smithsonian's NMNH Department of Mineral Sciences Rock and Ore collection. Large Eruptions of Jebel Marra Information about large Quaternary eruptions (VEI >= 4) is cataloged in the Large Magnitude Explosive Volcanic Eruptions (LaMEVE) database of the Volcano Global Risk Identification and Analysis Project (VOGRIPA).